My air plant found a new home inside a $5 fixture replacement shade yesterday. My plant had been sitting inside a glass jar, but I thought this would look a little more interesting. I've had this glass shade sitting around for several months because it doesn't fit any of my ceiling fixtures. Until now! I put some pea gravel inside to keep it from rolling off the table. With the weight inside, it's kind of like a Weeble Wobble. Remember those? Weebles wobble, but they won't fall down. 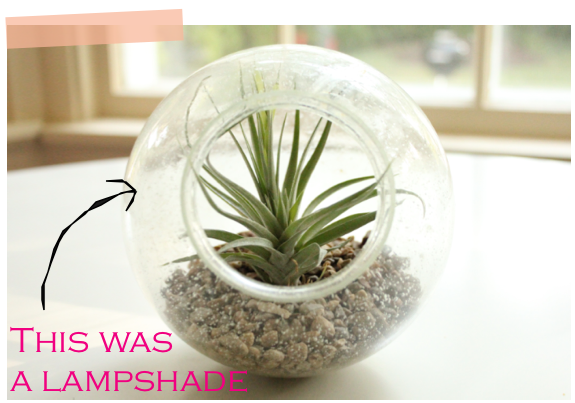 My DIY terrarium wobbles a little, but it won't roll off the table. If you try this, just rinse the gravel before putting it inside the class fixture. Otherwise, it gets a little messy in there. Now I can scratch glass terrarium off my wish list and remove the frown from my face every time I look at my odd sized light fixture. That is really cute. 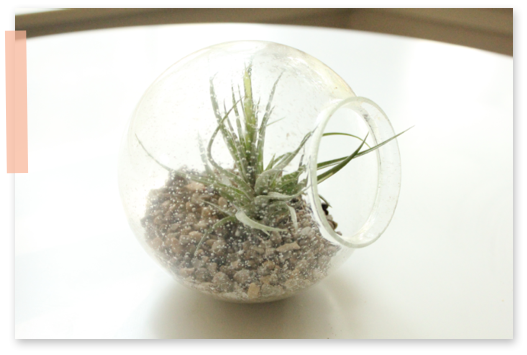 Do air plants need water or just humid air? Would be nice if you never even have to water it. You're supposed to water them 3 times a week, but I always forget. I just give it a little water through the leaves so it doesn't seep into the gravel and get all yucky inside. It's been doing fine for about 6 weeks now. I've been meaning to make a macrame hanger for about 2 years now and still haven't gotten around to it! Another way to keep it from rolling is to set it on an old keyring.